Chemical Engineering (and Prof. Glover's Lab) shown on South Alabama Facebook Video. 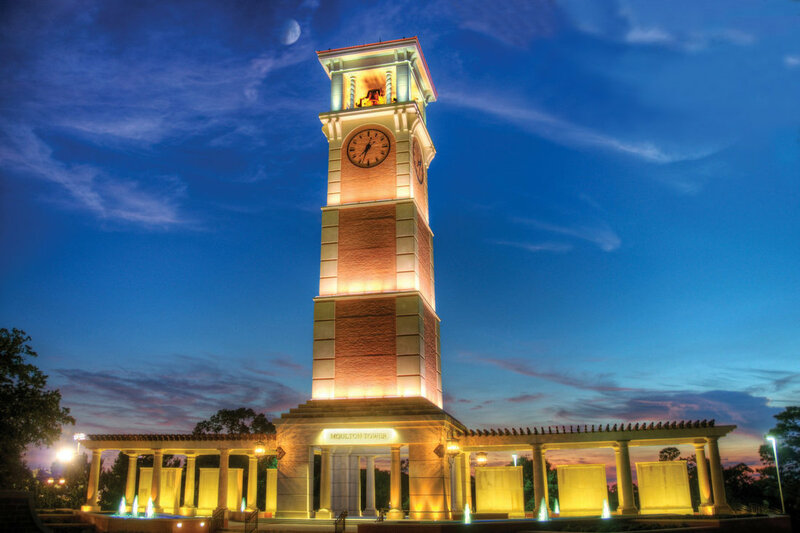 Collaborative research between the Glover and West Groups mentioned in the University of South Alabama Alumni Magazine (page 12). Glover Research Group shown in University of South Alabama fundraising video. Glover Group shown on University of South Alabama Facebook page. Glover Group shown in University Holiday Card. Thanks to Russ and Robin Lea for providing this award at the University of South Alabama; the recognition is appreciated. Prof. Glover talks with Prof. Krista Walton and Dr. Matthias Thommes during COPS-XI. Yuchen Zhang passes his Master thesis defense. Congratulations! Glover Group's Previous X-hab project shown on current X-Hab Solicitation and website. Meagan Bunge passes her D.Sc. Qualifying Examination. Congratulations! Chairs “Diffusion, Transport and Dynamics in Adsorption Systems” Session and presents work on adsorbents comprised of silica and ionic liquids. Membrane & adsorbents in gas applications discussed in depth at Barrer Centre launch day, led by Michael Guiver. Prof. Glover discuss FTIR spectra of a novel adsorbent sample with AB who is a chemical engineering graduate student. Jack Cunningham’s GRSP fellowship detailed on Alabama EPSCOR website. A related publication covers topics discussed during the speech. The Glover Group will begin work in the Fall of 2016 developing adsorbent materials for closed air revitalization in a collaborative project with NASA Ames, Marshall, and Johnson Space Centers. The Glover Group has begun work on developing textiles functioned with specific surface chemistry for the next generation of military fabrics. Aaron has accepted a post doctoral fellowship and will be supporting the Glover Groups efforts to introduce nanotechnology to textiles and surfaces. The USPTO has awarded a patent titled ​Reactive self-indicating absorbent materials, methods, and systems that is focused on utilizing magnetic materials to detect the residual life of filters. Meagan Bunge receives the American Institute of Chemical Engineers Separations Division Graduate Student Award for her work developing fibers containing with MOFs and other nanostructures. This work titled "Modification of Fibers with Nanostructures Using Reactive Dye Chemistry" details how reactive dyes can be modified to attache Metal Organic Frameworks, Quantum Dots, or Gold Nanoparticles. The results illustrate that the approach provides a broad platform to attach technology to textiles, fibers, and surfaces. Chemical Engineering Science has recognized the impact of recent work detailing the adsorption of gases on MOF-74. 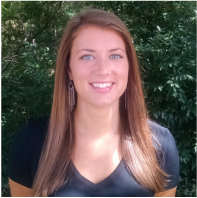 Meagan Bunge recently defended her masters thesis and enrolled in the doctorate program where she will continue her research. K. Neil Ruckart loading samples in the 2020 porosimeter. Neil now works as a Process Engineer at Hargrove E+C in Mobile, AL. Neil has commented that much like research, working for an engineering consultant firm is a fast paced environment. The work requires an ability to research and educate oneself on new concepts within a short time window while staying within a defined budget. The eXploration Habitat (X-Hab) Academic Innovation Challenge is a university-level challenge designed to engage and retain students in Science, Technology, Engineering and Math (STEM). The competition is intended to link with senior- and graduate-level design curricula that emphasize hands-on design, research, development, and manufacture of functional prototypical subsystems that enable functionality for space habitats and deep space exploration missions. Jack Cunningham has joined the Glover Research Group to study Metal Organic Framework Materials. Jack Cunningham has joined the Glover Research Group to study adsorbents containing ionic liquids. 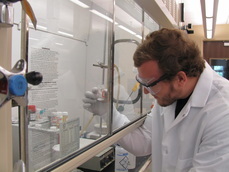 Jeff building novel adsorbent materials. Jeffery Kalagian has begun work on adsorbent materials and fabrics modified with nanostrcutures. 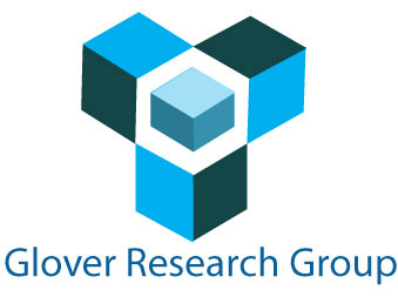 The Glover Group will begin work developing a novel method to attach nano-structures to textiles for military applications in the Fall of 2014. Prof. Glover was talked into competing in the undergraduate doughnut eating contest. Prof. Glover won the contest beating both faculty and undergraduate students.